Yes, it’s true. Now you can turn on your shower to get it at just the right temperature…from the comfort of your bed! Moen’s ioDIGITAL Shower System finally puts you in control of hot water in your shower, rather than vice-versa. I saw this at a home show for the home builders trade and I was amazed…what will they think of next? As we were building our new house, I made sure the Moen ioDIGITAL shower was installed. It’s been a long process since we started the house, but I’m pleased to say, it’s finally done…well, about 98% done. We just moved into our well connected home 1 1/2 months ago. Which means, you’ll be hearing from me as I begin using all of the fun technology we put into the house. The remote control comes with a mount so you can mount it on a wall if desired. It also comes with a magnet in case you have a metal surface you’d like to attach it to. The remote has an on/off power button and four preset buttons. Just press your button and the water will warm up to your desired preset. The remote control can work up to 30 feet away. The Moen ioDIGITAL shower system as a lot of great features…more than just being controllable by remote. It includes four presets – so up to four members of your family can set a preset with just the right amount of heat and water flow. 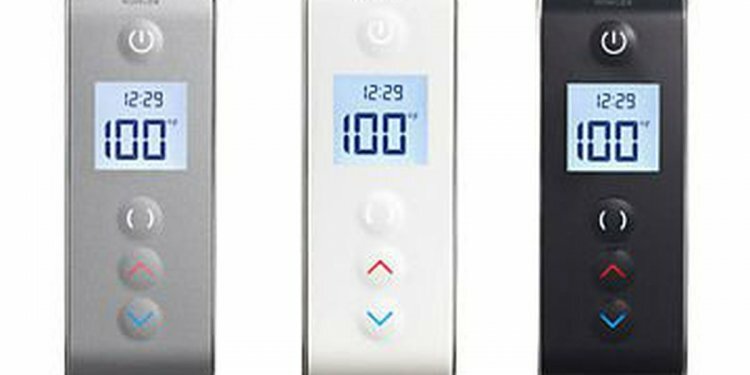 This means you no longer have to move the temperature handle back and forth every time time you shower to get the right temperature. What if you want to adjust it after you’re in? No problem, you can easily move the digital knob to your desired temperature. Like a strong shower flow when you shower? You can adjust the water flow to your desired strength. Just turn the water flow dial and the LED lights will flash to let you know your desired water flow is ready. The ioDIGITAL Shower head comes with a nice sized 7″ diameter rain shower. Moen states they have an advanced, self-pressurizing Immersion rain shower that produces three times more spray than most rain showers. This is my first rain shower, and I was nervous the flow was going to be weak. But I can tell you, the flow is very good, I’ve been very impressed. The Moen ioDIGITAL produces a great spray and with very good coverage. Don’t you wish you could put life on pause sometimes? While that’s not possible, it is with your Moen ioDIGITAL shower. And for the Green conscientious, press the shower’s pause button and you can shampoo or shave without wasting water. Press the pause button again when you’re done. I’ve used this feature to put the shower on pause BEFORE I got into the shower. After it warmed up to the right temperature, I put it on pause to do something really quick for my kids. It will stay on pause for a minute or two, then turn off.